This is Part 2 summarising my part of a talk for a Men's Mental Health Event in Wellington 2017, hosted by The Ancestral Health Society of New Zealand. If you haven't already, check out Part 1 here). This talk was a collaboration between Felicity Leahy (Naturopath and Clinical Herbalist) and I, as we’ve been working with many clients with a dual approach over the past year or so, and wanted to provide information for men on a broader platform. While we're both females, and you could rightly argue that we can't know exactly what it is like to be stressed or depressed for men, we do know what it's like to be stressed ourselves! And we have learnt a lot from our work with male clients. So we based our recommendations on what we know has worked for the men coming to see us and what the available science tells us is effective. But it's by no means suggested to be appropriate for all men with chronic stress or depression. We have noticed, that men often think it’s just them who are not coping, don’t talk to anyone about it, and tend to be overly hard on themselves and turn towards unhelpful coping strategies – further fuelling chronic stress/depression. The following recommendations are four area's I always target with my clients as they recover. Felicity's nutritional, movement, and herbal recommendations will follow in a subsequent blog. Breathing is something we take for granted – we all do it every day. But the way we breathe has major effects on our mental health functioning via the sympathetic arm of our autonomic nervous system (our stress response). Breathing is one of few ways we can switch our stress response into the opposite relaxation response. This sends a message of safety to our body, and it is really only from this place that we can physically recover, digest food well, absorb nutrients, engage and be present in pleasurable activities, and feel available for deep connection with meaningful others. How can you optimise your relaxation response? Notice if you're breathing shallowly from your chest or deeply from your belly. Also notice how many breaths per minute you are taking. When stressed, busy, or anxious we tend to revert to shallow rapid breathing. To bring on the relaxation response, we instead need to engage a deep diaphragmatic breathing pattern, with your belly rising like a balloon on your in-breath, and then falling on your out-breath, with a longer out-breath than in-breath and aiming for around 8-10 breaths per minute. When you’ve been chronically stressed you need to do this to re-tone the parasympathetic arm of your autonomic nervous system (relaxation response), via the fascinating vagus nerve. This means you need to schedule several times a day to do deep breathing for at least 5-10 minutes at a time. Then, as you build up your vagal tone (like strengthening muscles from regular gym attendance), you can use your breath to relax whenever you notice you're becoming stuck in a stress response. There are many technologies that can help with retraining your breathing - App's like calm.com, free audio breathing exercises available online, and many relaxing forms of Yoga (e.g., Yin Yoga). You’ll also benefit from use breathing before bedtime to get into a relaxed state for deep restorative sleep. One of the first signs of deteriorating into chronic stress is difficulty with getting to sleep, staying asleep, waking earlier than you’d like, and waking feeling unrefreshed. This is largely due to the stress hormone cortisol sending you the message that you are not safe enough to be asleep. Sleep is foundational to all aspects of your health and your choices during the daytime generally dictate the quality of sleep that night. Humans have maintained a light-dark cycle for thousands of years which involves us rising with the sun and sleeping with sundown, keeping our sleepy hormones in harmony. Since electric light (and subsequently screen light) was developed we no longer follow these environmental cues, which wreaks havoc with our ability to feel sleepy and sleep well. Lack of daytime sunlight exposure, rushed sedentary workdays, caffeine use, not to mention screen time into the wee hours. Blood sugar issues from inadequate diet can cause you to wake through the night, as can alcohol use which, although it may help someone to get off to sleep initially, does not support deep quality sleep. Sleeping pills also do not support deep quality sleep, and can be dependence forming, meaning someone can’t get off to sleep without them. Sleep helpers include focusing on how you lived that day to prepare you for sleep tonight. This starts with exposing yourself to sunlight early in the morning and having a daily movement regime. Optimal nutrition is necessary for good sleep – you use a lot of energy when asleep (more of this from Felicity in her upcoming blog). Being able to relax, unhook and unwind in the evening is also vital – so you’ll need a bedtime routine that you find relaxing and pleasurable, and to be in bed at a time that allows enough sleep. Lastly, one of the most important sleep aides is what to do with your busy monkey mind when you’re lying in bed and it wants to worry about and try to solve all tomorrows problems or to go over all the perceived mistakes from today. We all have a busy monkey mind, some of us slightly more than others depending on things like attachment style and past trauma. The degree of how speedy our mind is at any given time will be affected by a variety of factors. This ability to go over things and worry really served us in the past in terms of physical survival, and is still here to try to help us, but now we just have so many more things to be concerned about that are not to do with our imminent survival. Our wiring does not distinguish between life-threatening or perceived threats (e.g., being chased by a tiger versus a work deadline). Unlike any other species, humans have the capacity to keep our stress response going through our perception, thought, and emotion. The first step is learning about the purpose of thoughts feelings and sensations. These are there to serve you and help you survive. Your minds job is to give you thoughts – that's all it knows how to do - but these are not necessarily facts, the truth, or even anything you want to do. They are just ideas based on your life experiences and what's important to you. So, your mind has four relevant tasks here: 1) to go over mistakes in the past, to not make them again. 2) To anticipate future threats, to promote your survival. 3) To care a whole heap about what others think of you (if you’re not accepted by our tribe you’re left out to the wolves). 4) To want more stuff/resources (we are hunter-gathers) - again because this helps you survive. What we do though, is we tend to buy into our thoughts, believe them to be facts, respond to them emotionally as though they are happening, and get fused with them so that we can find it hard to see anything else. Generally stressed or exhausted men I work with experience racing thoughts where they go around and around in past mistakes or future worries. Thought content may be more negative, harsh or critical. They may feel anxious, down, angry, or ashamed, but avoid the experience due to how unpleasant it feels, and instead they experience increasing physical sensations of these emotions like a tight chest, racing heart, or knotted stomach. But just like our thoughts, feelings are also just there to guide us. They simply tell you what’s ok and not ok for you. They tell you that you might wish take action to improve things. When stressed, your feelings and sensations can also alert you to taking on too much, needing a break, or needing support. All vital information! The main approach I’ve found to help stressed men is called Acceptance and Commitment Therapy (ACT) combined with self-compassion skills. This is a mindfulness-based behavioural approach to living a valued life, through interacting differently with your experiences and taking the kind of action that is important to you. The key solutions for interacting with your monkey mind include 1) mindfulness skills which involve using the breathing skills mentioned earlier to bring you into the present moment, 2) not buying into what your mind tells you unless it's useful at the time (specifically the skill for this is called defusion), allowing your emotions and sensations to come and go instead of trying to get rid of them (specifically called expansion skills), to be more supportive of yourself in your self-talk (i.e. self-compassion), and to take action based on what’s important to you - your action in the here and now is the only thing you have any control over as the past already happened and the future has not arrived yet. Finding people you can talk to who listen well and give a damn also really matters when it comes to this stuff - we are not designed to be self-contained when it comes to emotions. The devil is in the details, so I’m not able to easily teach how to use ACT in one blog, but there are great resources on learning more about this including The Happiness Trap book (By Dr Russ Harris), Get out of your Mind and into your Life book (by Dr Steve Hayes) and the Headspace app. There are also many trained ACT therapists around in New Zealand. I just want to note that there are often factors to do with caring what people think of you that can drive chronic stress. For example, wanting to please others, lacking assertiveness, wanting to be seen as capable, not feeling good enough. I believe that examining these aspects of yourself all are part of the journey to prevent relapse in the future. This is probably the area I most feel fulfilled in working with stressed and depressed clients. When I ask men about their values and how they want their life to be, they often are unsure what values even are – but they do have them. Values are not goals – you don’t tick them off like buying a house or getting your dream job. Instead, these are guiding principles about what’s important to you, and you can live them in every single moment of your life. Living your values aligns you with how you want to be as a human in your short time here on earth and in itself can reduce stress. So, some of the deeper questions that always arise when men have been stressed and depressed are to do with their values and the important message their wise body has told them. 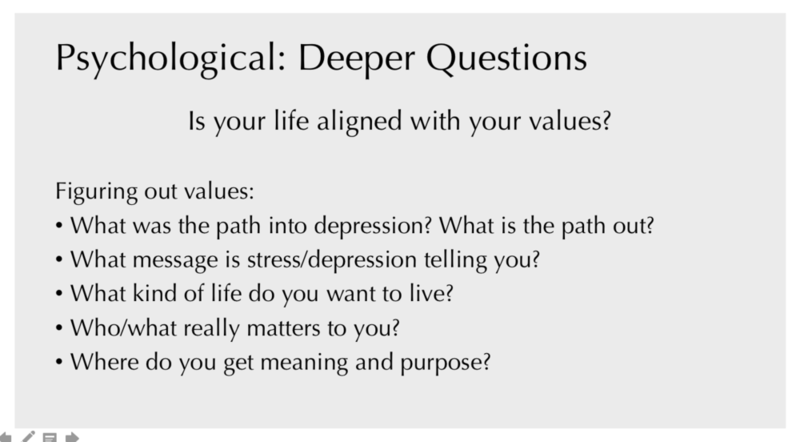 After considering questions like these listed here, men will often make radical changes to their life, work, lifestyle, diet, play, and relationships on the road back to wellness. Going through a values exercise, either on your own, using a book like the happiness trap, or with an ACT therapist can help to guide and motivate. Values are the 'why.' Why would you do something different or new? Why would you allow your uncomfortable thoughts and feelings to come and go? Why would you take action when that feels overwhelming or risky? Often, after achieving the changes to their life and recovering from the effects of chronic stress or depression men report being grateful for the experience. The experience was a wake up call to what’s important to them and how they truly want their life to be. I think this the most rewarding thing to observe as someone who has the privilege of this kind of work. Check out part three here: Naturopathic Solutions. Please note: this blog is here to share information on a public talk given on Men's Mental Health. The information here is not designed to replace individual advice from your health professional - and please do not stop or reduce medication without consulting with them first.